DeepSee Dashboard is a web application which displays a set of widgets where every widget is displaying a particular measure or the pivot. I am using a method taht calls a Dashboard in Deepsee web from an application , but I want to know if it's possible to not showing the header, this part that have the search button, the name of the namespace, etc.. In looking at the Production monitor within Ensemble, I was wondering if there is a way we could customize it for our use. I notice it is basically a dashboard. For example I would only like to truly display those Services, Processes, and Operations that are truly in dire need of attention. The Monitor out of the box just seems too busy, and I would like to simplify it. I was trying to find a sample how a Monitor Dashboard would be setup, but I am not seeing anything in ENSDEMO, or SAMPLES. Has anyone created a Custom Dashboard/Monitor for their purposes? Would you be willing to share an example with me? I do the exact same thing in namespace "ENSDEMO" and they all have their ">" to edit them and their properties. Hopefully there is just something remarkably simple I have missed in following the DeepSee tutorials / usage etc to allow other namespaces to create useful Dashboards... ?? I like to know how Ican determine the same colors of Series Detail of a graph that applies to all widjets. I created a theme based on a specific widjet and apply to others, but didin´t change the colors of the graph. Effectively I have widjet with pivot which include dates in from different cubes/dimensions, but exists the relation between the two cubes. 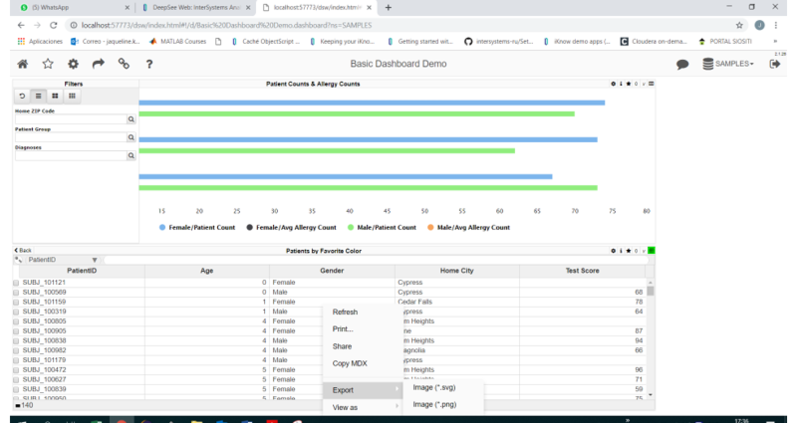 I'm showing below the MDX query from one pivot that uses the date "Fecha Creacion" that comes from cube "EVENTOSPOLICIALES"
When you deploy DeepSee solutions you often do not want grant a User %All Role to work with a particular Dashboard. Consider a Dashboard 'Dash' with a few widgets where listings are being used. If you manage a Role to get access to the Dash you need to grant access to %DB_DBNAME resource to have a database access, grant access to a Dashboard resource (if any) and ... grant SELECT accesses to all the tables involved in SQL queries being used in all the listings of widgets. And every time(!) when you update a listing you need to rearrange that access level in a Role (either grant new or revoke not used anymore) to the tables. How do you manage that? Manually? Or you have a magic shortcut script or recipes in hands? Would you please share? to display the Dashboard in the .NEt page. My problem is that connection to every Dashboard takes a while, so performance is low. Aside from doing a print to PDF is there any way to use the existing DeepSee "export to PDF" functionality to export the entire dashboard rather than each individual pivot or chart? Widget A refers to a query from Cube A and I want to filter Widget B from Widget B.
Widget's B pivot refers to Cube B, and which has different dimensions for the same data. E.g. cube A has the dimension Author and the Cube B has the dimension Member for the same data. So there is no way to filter such a widget B from the widget A. Is there any way to alter the filter expression for Widget B, just changing the value of the last part (Asia in this case) of the filter expression? There are DeepSee dashboards, which make sense only when filtered. Usually, they are used as Drill Target or New_window control with SETTINGS=Widget;FILTER=filtervalue. Is there a way to hide such dashboard from the Catalog or/and request the filter value once it is opened by User? How to filter two widgets in DeepSee New_Window command? There is a 'New_window' control in DeepSee Widget which opens the page in a new tab in a browser with a given URL. With the help of this control you can open another dashboard and supply some parameters in SETTINGS clause. to filter the widget W1 in Postings dashboard with filter [Author].[H1]. [Author].%26[$$$VALUELIST], where $$$VALUELIST is some value from the listing in a widget in Dash1. How can I spread the filter for two or more widgets? There is an option to introduce Named filters in Analyser and save it with the pivot. How can I make the Named filter available in a dashboard? Is there a way to add a scroll bar to a widget on a dashboard. I want to shorten the width of my bar graph widget but it causes the bar graph to be scrunch together. 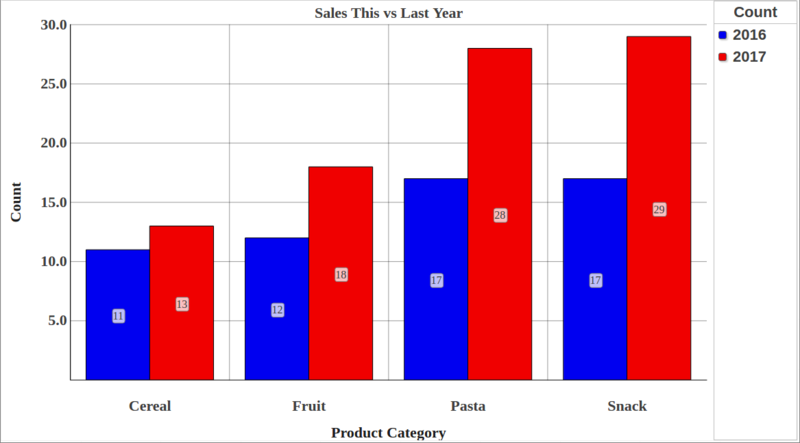 Also, is there a way to expand the width between each bar on the graph? A calculated measure is a powerful feature in DeepSee and can help to enrich your analyzes. In the case of complex or long running computations plugins can be useful. This article shows with a simple example how you can build and use a plugin in DeepSee. When creating a filter located on a dashboard that targets all, is there a way to narrow that filter down? For example, in our data we have some dates that are well out of range due to data quality issues, but they still appear in the drop downs. Is there a way to say, only make available the below dates in the filter? Another example, If we want to only look at Emergency data, it still provides all the wards for inpatient activity and activity in other hospitals, meaning, to get to just the Emergency wards you have to scroll through everything? Also, to follow this up, is there a way to order the drop downs? as for dates the oldest dates generally appear to be at the top where as we would prefer it to start with the most recent dates. Is it possible to create a widget in the DeepSee 2 dashboards that will just contain a block of text? Specifically text that isn't in any database, just free text that can be formatted. I've asked a lot of questions leading up to this, so I wanted to share some of my progress. 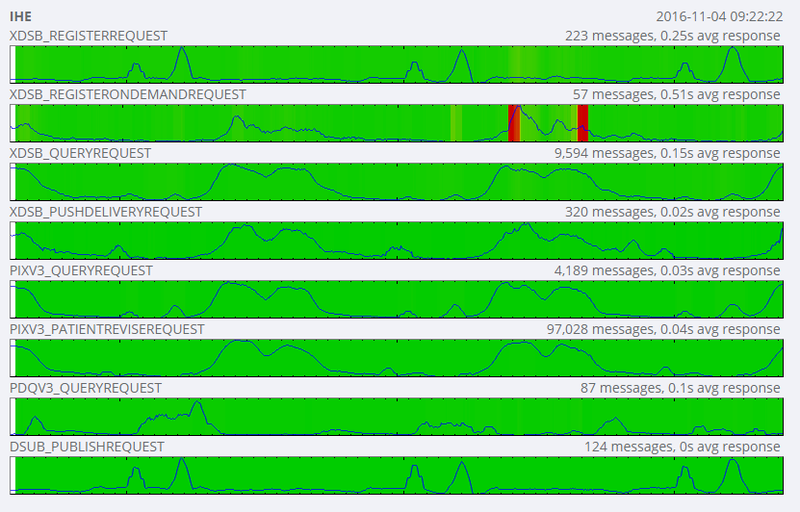 The blue line represents the number of messages processed. The background color represents the average response time. You can see ticks for each hour (and bigger ticks for each day). Hovering over any point in the graph will show you the numbers for that period in time. This is super useful for "at a glance" performance monitoring as well as establishing patterns in our utilization.